Some sites even include lists of the top pet-friendly companies, as well as job opportunities, as a way to attract more job-seekers. In addition to the high percentages of pet-related businesses, giant companies like Amazon, Google, Ben & Jerry’s, Etsy, and others all allow employees to bring their pets to work. But despite this growing trend, this can also bring a number of legal and health risks to the table. 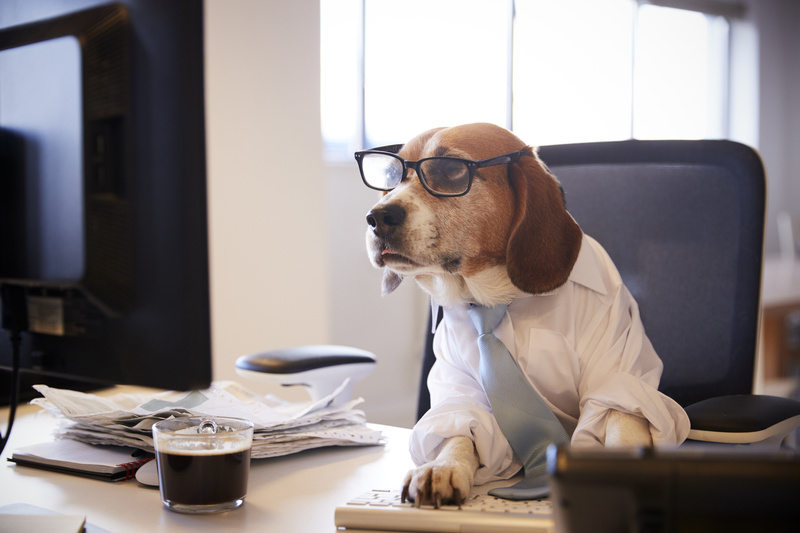 Here is a list of pros and cons of pet friendly offices. Statistics have shown that overall employee satisfaction and morale have increased after companies opened their doors to pets. They are also a point of common interest that can promote teamwork and communication – being that they are great ice breakers. Every pet parent knows that doggie daycare and dog walking services can be expensive, especially on a daily basis. Some just have no choice if they commute long distances or work long hours. But bringing their pet to work can eliminate a lot of these stresses, skipping the rush to get home from work or paying for someone to walk your dog. Many customers will react positively when seeing a pet in the office or when they are allowed the chance to interact with the pet; it can decrease their stress and improve their experience with the business. 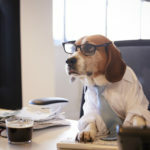 Having pets in the office can also improve the company’s image, giving it an innovative and progressive atmosphere. It’s been proven that pet friendly companies have a higher chance of recruiting and retaining employees long-term than those that are not. These employees also tend to work longer hours and have fewer absences because they don’t have to worry about rushing home to walk the dog or staying home to care for a sick pet. After reading these pros, making the office pet friendly can really like a good idea. But as with every decision and trend, there are consequences. Making the office pet friendly is certainly not for every business, such as those operating machinery or in a child daycare for example. Make sure to check out this list of the cons before allowing employees to bring in their furry friends. While some employees may work longer hours and be more productive with pets, others won’t. Pets can be a distraction for both the owner and neighboring coworkers by barking, whining, and needing frequent walks. They can also attract others who want to interact and play with the pet, when they should be working instead. The number of people with allergies to pet hair and dander will never improve. While some are willing to deal with the sniffles, others may battle severe reactions and even death when exposed. Some employees may have developed phobias of being around certain types of animals due to past experiences. To combat this issue, some offices are able to designate pet-free zones for those in these situations. As all pet parents are aware, pets can destroy anything, especially shoes. If pets are brought to the office, accidents will happen. Chewing the furniture, carpet, or peeing inside are bound to happen at some point. It’s a risk that all companies face the minute they say “yes” to allowing pets. Nobody will know the pet better than the owners, but as they are animals, their behaviors can be unpredictable. An office environment will be foreign to any animal; therefore, all pets will have different reactions. Different reactions can include fear and being nervous, excitement, and even aggression. In addition to their behaviors, dogs can trip and even bite coworkers, service providers, other pets, and even customers on company property. This opens the door to a number of insurance and legal issues. Before allowing any pets in the office, discuss all possibilities with an attorney as well as your insurance company to best prepare for the worst situations. 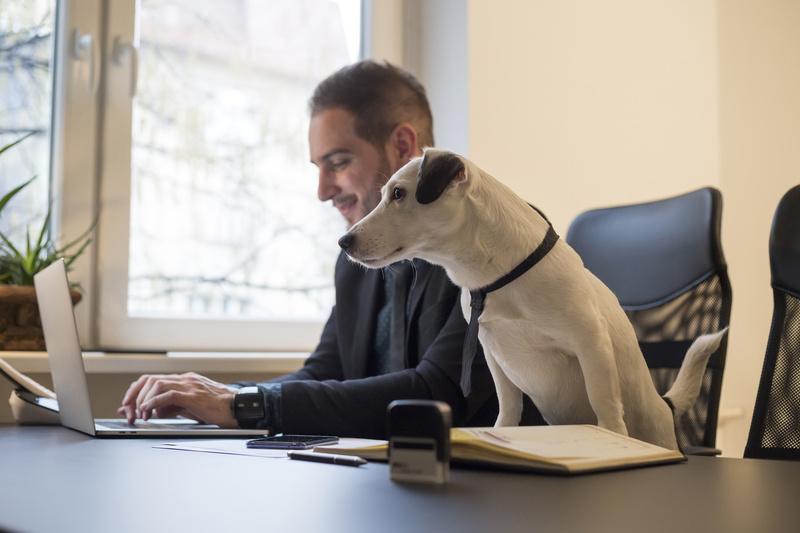 Having a pet-friendly office environment is a great way to retain employees long-term, but there are drawbacks that all companies will face. Thus, the need to have a pet policy is crucial. This should include what types of pets are allowed, stating the frequency and/or which days pets are allowed, how they are to be contained, and placing an animal on probation (or permanently banning them) for destruction or showing aggression. Many companies may own the building in which they operate, but others may lease from an association. Whether or not that association allows pets is up to them, so the employer may have no say in whether to allow pets or not. If having a pet friendly office is something you believe in, make sure to discuss this with the building manage before signing any lease. Otherwise, you may need to look into owning the property instead. Looking to move to a pet friendly building? Allow Chicago Office Movers to help. Our union professionals are each trained, experienced, background-checked, uniformed, and insured to safely relocate your business. Whether moving across town or across the country, our full-service moving company will work with you - regardless of what you need moved – to ensure that everything arrives to your new location safely and on-time. Chicago Office Movers also has the resources to move a number of specialty items, including industrial equipment, desks, office furniture, lab equipment, and servers. For a free estimate on your next commercial move, contact Chicago Office Movers at 312-244-2246. 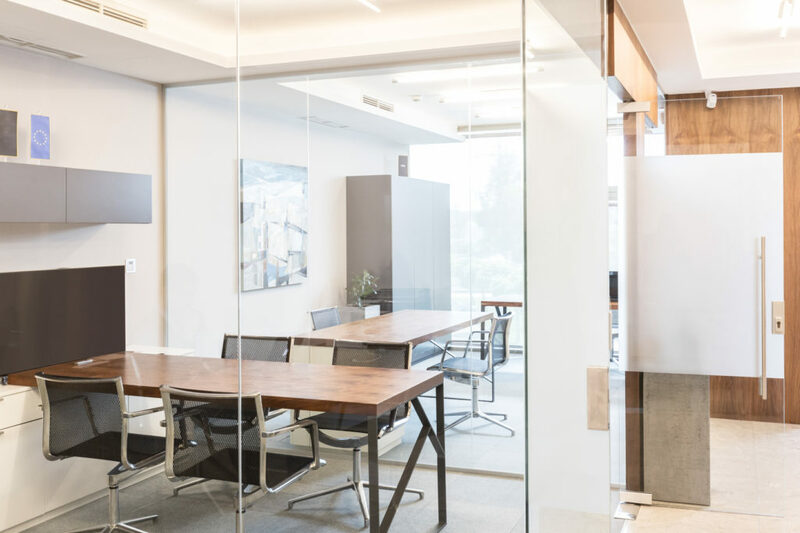 Access to a high-quality talent pool, greater workspace, and company expansion are among the top reasons businesses relocate. Hiring professional assistance with this major event offers to relieve many of the stresses associated with a company relocation. Preparing staff for the imminent transition, however, falls upon the shoulders of the business owners. The decision to relocate, whether to a building across the street or to one out of town, affects employees significantly. Workers will be obligated to consider changes to their commute and re-evaluate childcare situations. Plus, if the new office is significantly further away, your employees will have to deliberate whether or not to relocate. The routine of employees’ everyday lives will be disrupted, making it important to relay the news with sensitivity. Respecting your employees’ time and contributions means giving them appropriate notice of the relocation. Use an empathetic approach to notify your employees well in advance—at least two to six months—of the move. Loyal workers will be motivated to change gears to better suit the new work arrangements. Provide a concrete moving date, the new business location and how employees can best prepare for the new office. In addition, give all workers the new office address, phone number, parking amenities and public transportation options. Keep all employees regularly updated on the move. Frequently sending emails and placing signs regarding the office move helps ensure workers stay in the know. Employees tend to lose trust in the company or experience resentment when managers fail to provide adequate information about the relocation process. Keep communication lines open, making yourself available to answer emails or discuss the move in group meetings. Along with communicating the relocation plan, give your employees a good reason for the move. Will the new location allow the company to reach a larger number of customers? Can the employees expect better access to technology and other workplace infrastructure improvements? Involving those who strive every day to deliver optimum service offers a boost in morale, so that they can continue giving their best even in the new office environment. Ask workers for input on the new office layout and ways their new workspaces can help them achieve their finest work. Employees who feel included tend to demonstrate positive feelings toward the company. Business owners might create transition teams, assigning groups of employees to take charge of certain aspects of the move. Involvement gives workers the opportunity to ask questions, address concerns, and be an integral part of this important milestone in the company’s history. Starting fresh in a new town, city or state provides ample opportunity to declutter and reorganize. Prepping for a new office is the apt time to discard unnecessary paperwork and files. Instruct your employees to pack essential files, paperwork and any small equipment. Provide sturdy packing boxes, labels and plenty of shipping tape to streamline the process. 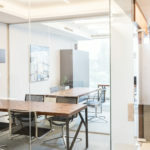 Relocating an office requires the effort and abilities of everyone in the company. Delegate important tasks to employees to help make the transition as smooth as possible. For instance, establish a committee to be responsible for double checking the lease dates of the new building. This team should also ensure the utilities (gas, water and electricity) as well as janitorial services and security systems are set up to operate upon the arrival date. This committee could also be given the task of obtaining keys to the new building and receiving necessary parking details. A second liaison may be instructed to get ahold of the map to the new building. Having employees who are familiar with the new layout is extremely beneficial on moving day. These workers can instruct moving personnel where to place office furniture, including desks, shelving, equipment and other property. If your office features specialized equipment, permission from the vendor may need to be acquired. This second committee can request and obtain necessary authorizations. You may even wish to delegate to a third committee the job of hiring a professional moving company. This third team could be tasked with the additional responsibility of bringing on furniture installers, design firms and necessary contractors to ensure an easeful transition. The committee should seek a professional office mover who is experienced in office relocations and offers valuation coverage. This group of employees can also be in charge of getting moving quotes and determining whether or not the mover offers fixed rates. Shifting offices is a team effort. Ensuring success starts and ends with a constant flow of communication among employees and between business owners and their staff. Upon the move, a company’s culture has plentiful chances to reinvigorate. While relocating an office is a taxing burden, the results are well worth the financial investment, time, and energy. If you plan to hire or designate staff to handle hiring an office mover, turn to Chicago Office Movers. As a professional office moving company with licensed and union movers, Chicago Office Movers takes the hassle out of moving day. Chicago Office Movers are experts in office moves of all sizes. Our numerous awards, years of experience, and five-star reviews are validation of our professionalism and skill. Area customers include Northwestern University and Alcatel Lucent, among many other small, large and well-established businesses. 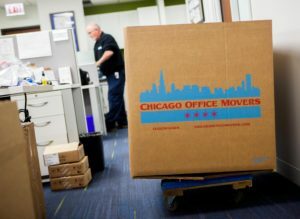 Included in Chicago Office Movers’ comprehensive list of services are paperwork storage, the option for short- or long-term storage, availability to move locally, long distance, or internationally and insurance contracts. Our professional movers have the manpower and equipment to shift all types of office goods, such as IT systems, lab equipment, electronics and cubicles. We also handle packing and unpacking, alleviating business owners of this time-consuming task. At Chicago Office Movers, we take pride in our professional team of movers, years of experience, and essential equipment. For invaluable office relocation advice and a free estimate, contact Chicago Office Movers at 312-244-2246. Everyone has to move sometime or another. But seasoned moving customers are well aware that not all moves run smoothly. Just as each moving company will differ in their services and prices, it’s extremely important to know what to expect on moving day. So you’ll want to do your homework and research as many vendors as possible. Chicago Office Movers can help you with decommissioning items to local non profit organizations. Ask your Senior Relocation Manager for more information. You might be surprised to find that a number of companies operate under various names to avoid being assessed by the Better Business Bureau and other online review platforms. Make sure the company has an address that is local and information about their licensing and insurance. Check for any other name the company “does business as” in addition to their state and federal license numbers. Also make sure to check their online reviews, reviewing any complaints and compliments about them. While some can’t be avoided, reputable moving companies will not require a large deposit before moving. The service – at least the majority - should be paid at the end of the move. Otherwise they may disappear with your belongings and you have a lawsuit on your hands. When you do pay, use a credit card to protect against possible fraud. When walking through your home, the estimator will take an inventory of all your items and furniture to determine the bulk weight of the home. They should also be thorough and check all storage areas, including drawers, desks, lobbies, bookcases, and filing cabinets. A significant factor of the moving cost will be the overall weight of your belongings as well as the amount of space it will take up on the truck. When presented with the estimate, look it over carefully and make sure you understand everything on it. 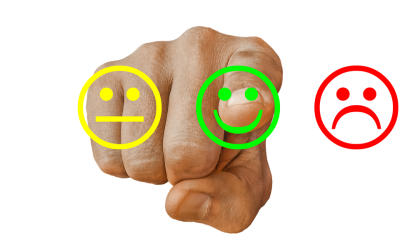 More and more potential customers are trusting online reviews as if they were recommendations from their friends and family. A reputable moving company will have an overall high rating, provided that they have served their customers well. When researching these reviews, you will find that few to none will have a perfect score. This is OK. Some customers just can’t be satisfied. But it will be up to you to decide which company to hire based on what others have said. Keep in mind that many moving companies – even those that are reputable – will add on additional fees for specific cases. Things like going up and down more than one flight of stairs, narrow streets, truck transfers, and moving to or from 2-story homes are all likely to result in additional fees. However, this should be noted in the initial estimate, so you won’t come across any surprises when you get the final bill. You can also call the company ahead of time if you are unsure of whether or not something will incur an additional fee. Just keep in mind that all movers are different; therefore, while one company may include going up multiple staircases in the service, it may be counted as extra in another. Keep in mind that if you decide to pack your items yourself, the mover is not responsible for any damage to them. But if the mover does packing and things are broken in the process, they should be covered under the mover’s insurance policy. Before hiring the company, ask about their packing experience and the materials they use to protect items. This will be helpful to know when they pack up your inventory, machinery, or special equipment. Binding Estimate. This includes a guaranteed price for the move that includes all additional fees and requested services. If you want to add on additional services after the contract is made, these fees need to be paid within 30 days after the move. Non-Binding to Exceed Estimate. This prevents the company from charging for overages to the original quote they provided. The estimate given is the maximum you will need to pay for the services provided. Non-Binding Estimate. This means the mover cannot charge any more than 10% above the original estimate. Just know that the overage must be paid within 30 days of the move. It’s understandable that not all damage to your items will be noticed right after the move. But you are given 9 months to report any damage or other problem to the moving company, as well as to file an insurance claim. So if you open any box a year later and find something shattered, it’s too late. On moving day, open as many boxes as you can after they arrived at the new location and be thorough when checking for damage. All problems should be listed in details on the mover’s copy of the final bill, and make sure to check it for any changes before signing it. After making your claim, the mover has 30 days to acknowledge it and 120 days to deny or accept charges for it. Rogue moving companies may present you with a blank moving contract before adding services and charges to it. Never sign it. Everything – and absolutely everything – must be listed in detail, including extra fees, pickup, and delivery dates. Always read your contract carefully, checking that all of your items are listed, before signing. If a computer wasn’t listed on the inventory form before the driver pulls out of your garage or parking lot, you shouldn’t expect it to be in the box. You also won’t be able to file an insurance claim for it because it wasn’t listed on the contract. Reputable moving companies will offer a number of insurance plans you can add on to protect your belongings. This way the moving company will assume liability for the value of your belongings moved. Be sure to take a detailed estimate of the overall value of your items before choosing the insurance coverage. While some moving companies can offer better solutions for customers than others, it’s crucial to find a reputable moving company that keeps your best interests in mind. From start to finish, the service should be professional, friendly, and financially accurate. Remember to always stay on the lookout for red flags such as asking you to sign blank contracts, missing items from the inventory, and “rough” estimates. If you live in the Chicago metropolitan area and are looking to move your business, check out our professionals at Chicago Office Movers. Our union movers are dedicated to professionalism while keeping your best interests in mind. We understand that many items and furniture within a business are fragile as well as the information that must be kept confidential. As we conduct hundreds of moves every year, we know the best ways to make the process as smooth as possible. In addition to our services, each of our movers is background-checked, trained, certified, and experienced to provide you with the peace of mind you need during the transition. Our staff will also be able to handle all aspects of the moving process for you, including move management, packing, furniture assembly, decommissioning, and more. Our union movers will work with you every step of the way. This includes providing additional information like answers to frequently asked questions, a Commercial Moving Timetable Checklist, what to expect from the process, and more. For more information regarding our commercial moving services or to schedule a free estimate, give us a call at (312) 244-2246.